Maria ("Minnie") Gerard Messenger was a philanthropist from Great Neck, Long Island; she was born on 29 May 1849 and died on 27 May 1937. She was the daughter of Brooklyn merchant and banker, Thomas Messenger (1810-1881). An invalid for the last 26 years of her life, she lived with her companion and fellow philanthropist, Miss Elizabeth Chamberlaine, at "The Orchards" in Long Island from 1881 (obit, New York Times 29 May, 1937). Messenger was also a book collector, and her library was sold at auction by G.A. Baker & Co. on 24 Jan. 1938 (pt 1: American first editions, art, books for collectors, Grolier Club publications, books by William Loring Andrews, Kelmscott Press and other private presses, and cookery books); 14 Feb. 1938 (pt 2: English authors & illustrated books); 28 Feb. 1938 (pt 3: Americana, books about books, bookplates and bookplate literature); and 22 March 1938 (pt 4: French literature). 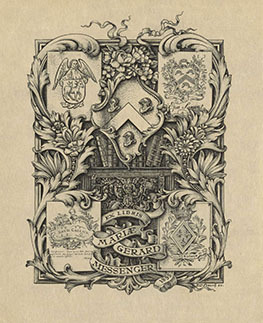 The Messenger collection was originally composed of the present group of women's bookplates plus approximately 3500 additional plates divided into four groups: American, English, French, and Canadian. The entire collection was donated by Messenger to the Great Neck Public Library in April 1933 in memory of Ms. Elise Messenger Gignoux, member of the library's Board of Directors from 1905-1932. In May 1986, the women's bookplates portion of the collection was donated by the Great Neck Public Library to the National Museum of Women in the Arts. NMWA donated the collection to the Grolier Club in March 2016. The Grolier Club was founded in 1884 by a group of nine bibliophiles dedicated to the art and history of the book. The Library was established to serve the primary mission of the Club, which is (to quote from its Constitution) "to foster the study, collecting, and appreciation of books and works on paper, their art, history, production, and commerce.” It pursues this mission though the maintenance of a collection devoted to all aspects of the book and graphic arts with special strengths in the history of the antiquarian book trade and bibliography. The Library’s holdings of book catalogues are among the most comprehensive in the country; and these, along with the papers of important bibliophiles, bibliographers, and antiquarian book dealers, have long been recognized as an important and often unique resource for Library patrons.